Big fan of your work, havent been following long but its all good stuff. So creative but then again they seem simple aswell in way, even though i would never have thought of them in a million years. that one made me laugh out loud, how do you think of all these funny comics! does he get stained glass spinners? Hey look, in the background, it’s Boston! He does have a variety of cars. Man, I’d avoid that auto-glass repair shop. If they offer that, I’d leave. Is that Boston in the background? Such a car would be as inpractical as it would be pleasant to drive. I imagine the rays of colourful light as they come in through the windows… and I want such a car. It would go well with the invisible green car. I would even learn to drive for one of these. I think it partially wasnt Biff’s fault. I think that Tree jumped in front… I meen look around, are there ANY other trees? 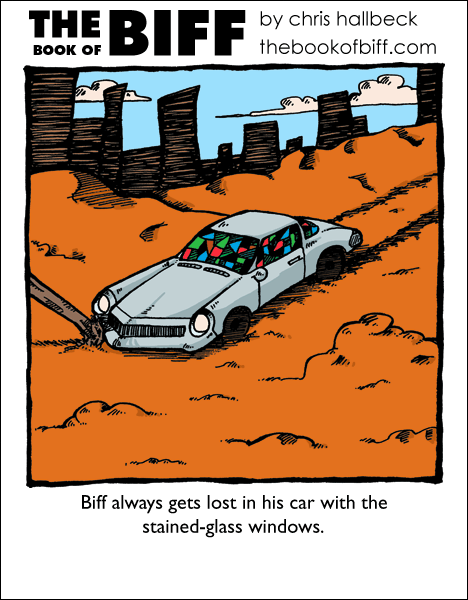 Makes me want an invisible green car with stained-glass windows……. right underneath is the ad for a stained glass studio. Reminds me of Brimstone from Twisted Metal Black. No he has 2 cars one was stolen.